2008 August archive | YORK BLVD. 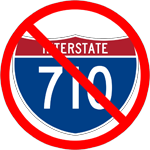 Today is a big day for unincorporated Los Angeles County and for anyone who likes tacos, or simply doesn’t like a nanny-state dictating what choices they can and can’t make. Below is a letter we sent out to those who have signed our sister site/petition, http://www.saveourtacotrucks.org/. To briefly summarize, the Los Angeles Superior Court struck down the county’s recent ordinance effectively outlawing our beloved taco trucks. Look for us out this week, we’ll be the two happiest gabachos at La Estrella. It’s a great day to stand on the side of hardworking Angelenos, fair capitalistic competition, and delicious food. Today in Los Angeles Superior Court, Judge Dennis Aichroth ruled in favor of our hardworking taqueros stating in part that the recently enacted law effectively banning taco trucks was “too ambiguous to be enforceable” and was “arbitrary and not based upon any rational, intrinsic or natural basis”. Furthermore, Judge Aichroth agreed with an argument we’ve championed from the beginning, writing, “this attempt to restrict the operation of catering trucks [...] is a pretext for creating a “naked restraint of trade” and, as such, must be declared invalid”. In short, Gloria Molina and her developer backed cabal of myopic gentrificationists have lost. The people of Los Angeles have won. I remember when a cup of coffee more complicated than drip required at least a commute to one of the chains in Glendale or if you wanted to hob nob with disaffected PCC literati (is there really such a thing? ), Equator Cafe in Pasadena. True this was only 1999, but the ensuing decade seems to be bringing an absolute deluge of cafes to our extended neighborhood. On our modest map alone there are links to at least five coffeeshops in the immediate area and I’m not sure if we’ve even included Swork, two of the Starbuckses, the Oxy/Goya Cafe, and the enigmous Cafe Princesa on York which shares shares space with the sign store. Well, throw Cycleway Cafe into the mix. They seem to be borrowing heavily from the Starbucks motif of overstuffed chairs, small tables, and a clean well-lit interior. Even the display case of pastries, sandwiches, and drinks evokes flashbacks to their big bad competition from Seattle. On a more positive note, the service was very friendly as the barrista told me I looked a lot like his (I can only assume very good looking) friend’s brother. Also, the owners seem to be at least intellectually invested into the history of the area as they’ve taken their name from the late 19th Century precursor to the 110 freeway. Free wifi is nice as is the outdoor seating. If they ever expand their menu, I might even add this place to my weekend breakfast rotation. Things have been (thankfully) quiet in the area this week. A power outage in Cypress Park from a downed power line on Figueroa seems to have been the highlight. The big yellow wall on Paisano’s Market has already been tagged and painted over; Antigua will be hosting a commercial shoot for NFL.com; Based on a recent walk-by, Cafe con Leche won’t be opening imminently. 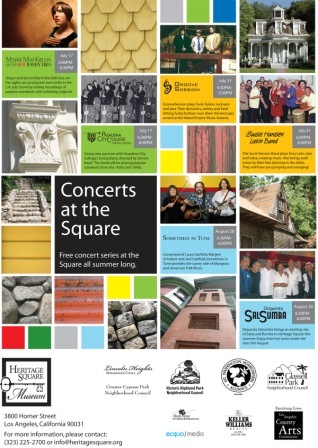 Still, thankfully we get emails from people in the neighborhood and Brian from the Heritage Square Museum asked us to help promote their last Concert at the Square for the summer. I’ve been out of town so much I haven’t made it out for one yet, but they’re free and within walking distance of the gold line. The lineup calls for the dubiously titled “Sometimes in Tune” to perform their Bluegrass and “Orquesta Salsumba” to put on a set of salsa and rumba.